Its emphasis on clean, high-quality visuals makes it ideal for showcasing products—and now it’s the place for shopping, too. Sixty percent of users (that’s 600 million people) seek out and discover new products on Instagram. 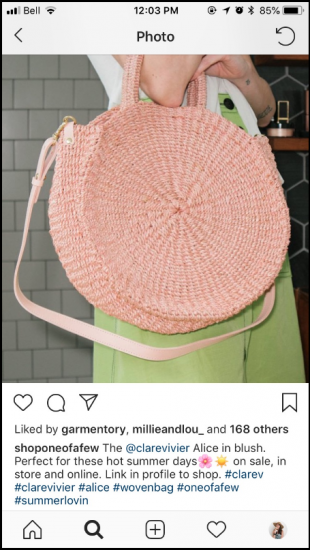 But with the launch of Instagram Shopping in February 2018, brands are able to tag products directly in posts and Stories, and take customers directly to the item they want to purchase. With the launch of a new “checkout” feature in early 2019, users no longer even have to leave Instagram to purchase many of the items they discover there. 130 million Instagrammers tap to reveal product tags in shopping posts each month. If you’re not sell products on this network yet, it’s time to get started. There are a few steps you need to take before you can start selling products through Instagram. Only businesses can sell products through Instagram. At this time, you can only sell physical items that comply with Facebook’s merchant agreement and commerce policy. 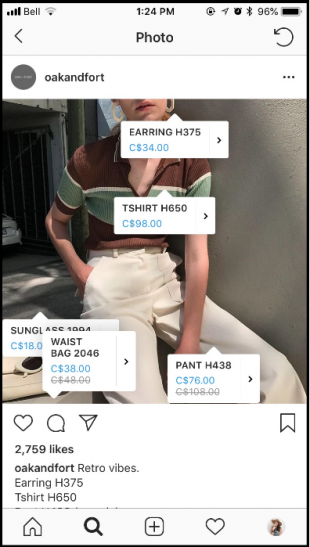 The products in your catalog are what you’ll be able to tag in your Instagram posts and Stories. After that’s set up, you can add a Shop section on Facebook. This may take a few days. Once you’re approved, you’ll receive a notification from Instagram. From there, you can begin adding products to your posts! You can tag up to five items per image, or up to 20 if you are sharing a carousel post. After you’ve finished writing the caption for your post (just like you normally would), select “Tag Products.” This option will appear below “Tag People” once you have shopping enabled on your account. Note that you can only tag products or people in a single post, not both. 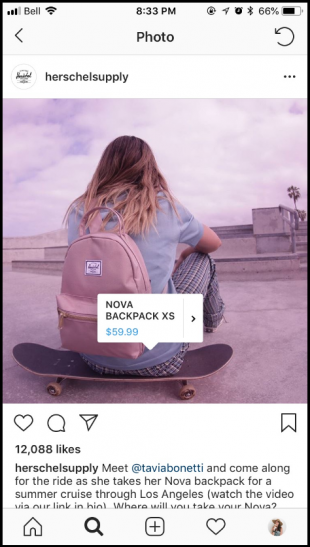 Instagram will pull items from your Facebook product catalog that match the words you type, so you can tag any product that you’ve added. Once you’ve tagged your products, you’re ready to share! Posts tagged with products will appear on your feed with a little shopping bag icon in the top-right corner. 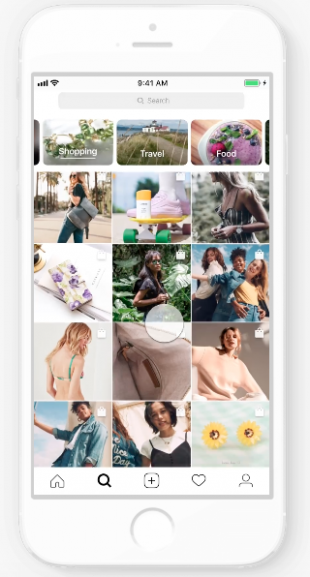 Instagram launched Shoppable Stories globally in September 2018. 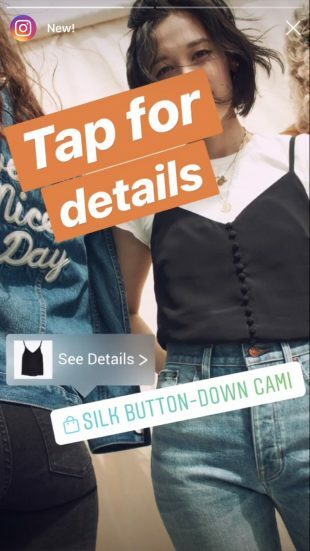 Businesses that are approved and set up to use Instagram shopping can add one product sticker (with customizable text color) to any story. When a customer taps on the product sticker, they’ll be taken to the same product details page they would see if they tapped on a shopping post in their feed. On this page, they’ll be able to see additional product images from your catalog, product details, similar items, and a link to your mobile site to make a purchase. Step 1: Add your Story (video or picture). 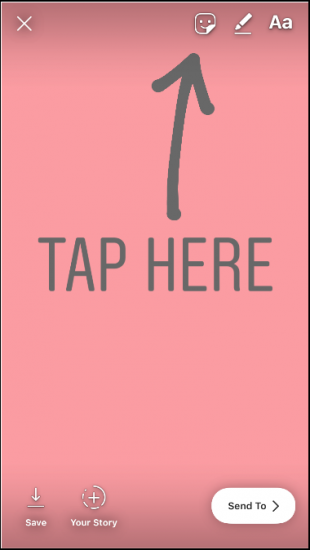 Step 2: Tap the sticker icon in the upper-left corner and select the product option. Step 3: Add your item (only one per Story). As with a post, you can find any item in your product catalog by typing its name. You can also change the color of the sticker at this step. Instagram’s Explore tab is a powerful tool. More than 200 million visitors go there to discover new content and dive deeper into their interests every day by browsing topic channels that the Instagram algorithm has curated for them. 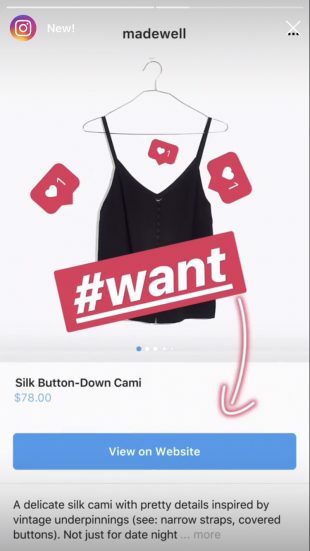 In September 2018, Instagram launched a topic channel specifically for shopping. The channel will be based on each user’s specific shopping interests and will display shopping posts from a variety of businesses that the user may like (but which they don’t necessarily follow yet). Getting onto the Explore tab could be a huge boon to small businesses without large followings. 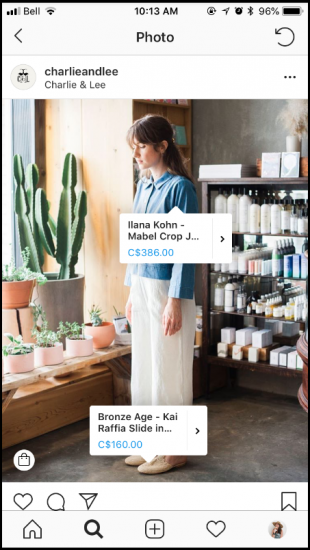 In March 2019, Instagram took its in-app shopping experience one-step further by launching a checkout feature. 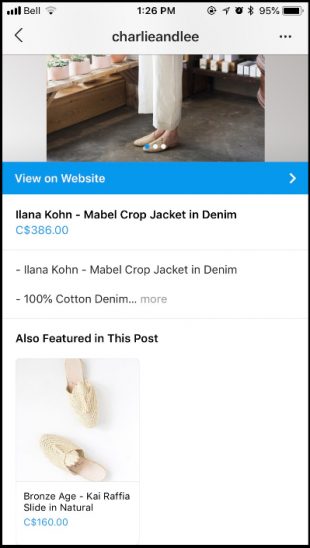 Checkout is just what it sounds like—a feature that enables users to purchase products without leaving the Instagram app. However, the feature is still in beta in the United States. Twenty-three brands—including Nike, Outdoor Voices, and Zara—are involved in testing before checkout rolls out globally. As of March 2019, no set-up instructions are available for brands outside this exclusive testing cohort. 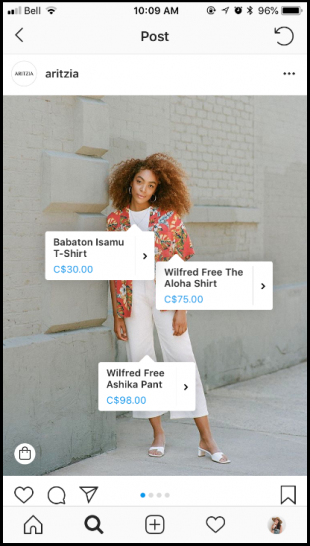 But brands who are eager to participate would do well to get familiar with either Shopify or BigCommerce—the two e-commerce platforms Instagram is working closely with on checkout. You can also give your two cents on the new feature by filling out this form. Tagging an image or carousel is the perfect way to get more value out of your photos. If you invested in a high-quality lookbook or product catalog that makes your products look amazing, take advantage! Make sure it’s clear which tag goes with each item, by adding space between them. This will make the post easy to navigate and minimize any possible confusion. Encourage your followers to explore your store and increase the utility of each post. Multiple items mean multiple chances to catch your customer’s eye. This boosts the visibility of any item you tag, leading to more opportunities for browsing and buying. The items you tag in posts must be items in your Facebook product catalog. For brands with items that have similar names, ensure you are tagging the right ones! Shopping on Instagram is appealing because it’s direct. Sending a customer to the wrong item is a distracting nuisance. Speaking of distraction, ensure your product names are descriptive and clear. Consider a naming system that allows you to easily identify each product. For example, Oak + Fort uses unique numbers for each item. As Instagram evolves into an extension of your e-commerce platform, it’s important to make it feel like a natural fit for customers. The transition from clicking on an item in your Instagram shoppable post to the product page itself should be seamless. On that note, make sure that your Instagram posts and Stories reflect the true appearance of the item. Size, details, colors, and functions should be consistent between tagged posts and product pages. If they’re not, people will get confused or annoyed—and you’ll miss out on a sale. This is a tried-and-true method for getting more Instagram followers—and it’s just as valid for getting more Instagram shoppers too. If you’ve got a newsletter, include snapshots of some of your best shoppable posts, and a call-to-action to shop your account. Cross-promote your Instagram feed on Facebook or Twitter. Run a contest across your social channels and include following your Instagram account as part of the entry. By making your Instagram account more discoverable, you’ll help your followers and fans on other platforms find and shop your posts. Your posts will get better visibility on Instagram—both on your followers’ feeds, and in the coveted Explore tab—if you crack the Instagram algorithm. That means following best practices for posting and sharing great content that your fans want to engage with. Now that users can follow hashtags, they have even more opportunity to discover your products. If you use hashtags effectively, you can boost your visibility and reach new customers. Research hashtags that competitors and influencers are using, and add them to your posts. Think “visuals first” on Instagram. You want to ensure that your posts and Stories are eye-catching and compelling. That’s what will catch someone mid-scroll and entice them to tap the post for product details. Don’t compromise the quality of your photos at the expense of pushing out a lot of product images. If they don’t look great or work with your brand, your followers won’t click on them. Woodlot, a Vancouver home and beauty brand, does an inspiring job of incorporating their products naturally in their posts. Their shoppable posts look like any other high-quality, beautifully edited image on their feed. Your Instagram feed isn’t your product catalog. It shouldn’t look like a shot-for-shot collection of every item you retail. Instead, it’s a dynamic space to get creative and show your followers the unexpected side of your brand. That’s why it’s also the perfect place to see your products from new, interesting angles. Glossier, a beauty startup, shares photos of how their products look on customers. These are very persuasive when contemplating a purchase, and add a real-world relatability to the brand. As a bonus, these diverse photos of your products at work will add visual interest to your feed, keeping your audience interested and engaged. People don’t want to see the same thing all the time, and will unfollow the second you start boring them. Instagram shoppable posts and Stories are awesome opportunities for increasing your sales and making it easy for your customers to find and fall in love with your products. Discover how the new frontier of Instagram shopping can benefit your brand and grow your sales! With files from Shannon Tien. 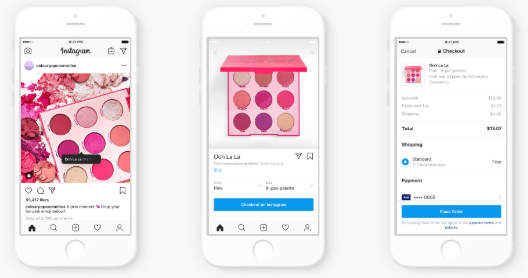 The post How to Sell Products with Instagram Shopping (and Shoppable Stories) appeared first on Hootsuite Social Media Management.